Many voters are being taken in by Governor Romney's experience as a businessman. However, his experience with Bane Capital was described by Romney opponents in the primaries -- other Republicans -- as "vulture capitalism." However, with Romney's selection as running mate, Glenn Beck's "soulmate," Paul Ryan, there is a hell of a lot more at stake besides the speed at which the nation recovers from the worst economic collapse since the great depression. We live in, and execute our professional lives in, a global economy. We have to compete with rising nations, and that is going to require investments in education. Romney has flip flopped on the issue of hiring teachers, like he has flip flopped on so much else. It seems that he is more concerned with the well being of corporate investors than he is with the workers. Romney is clearly of the 1% or more accurately the 0.01%. He is, in no uncertain terms, a plutocrat, a member of the plutocracy. This was clear, for those who have listened to the entire recording, when Gov. Romney was addressing his donors earlier this year and not expecting his words to be made public. What does this mean? Plutocracy: 1.the rule or power of wealth or of the wealthy. 2. a government or state in which the wealthy class rules. 3. a class or group ruling, or exercising power or influence, by virtue of its wealth. A recent interview on The Colbert Report with Chrystia Freeland, the author of Plutocrats, helped shed some light on what the priorities are for the plutocrats in the contemporary global economy. When you're a plutocrat running for national office and your tax plan will mostly benefit the wealthiest Americans, it is probably a good strategy to lie about what your intentions are, lie about your opponent and lie about your record. Otherwise, most Americans will simply vote for the other guy. claims Obama is a "pathological liar"
But isn't Obama lying about Romney and his record as well? According to Beck, he's the only candidate who is lying. Beck does not publicly mention Romney's lies. (Cherry-picking facts is an element of propaganda.) 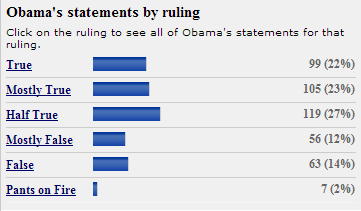 Indeed the President has been dishonest, but take a careful look at the following charts developed by PolitiFact. Which candidate is mathematically more honest? 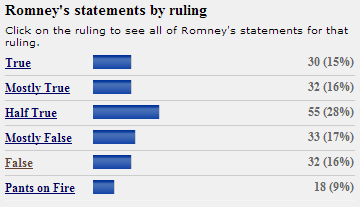 The President's claims are true more often and "Pants on Fire" false far less often than Romney's are. However, voting for the lesser of two liars is not exactly inspirational. If the President no longer inspires, he is something that Gov. Romney is not: consistent. Unlike Romney, we know what Obama wants for the country. The point of this piece though is that Romney is something that Obama is not: a plutocrat. There are many reasons for someone the left to vote for or against President Obama, but opposing a plutocrat who believes that corporations are people is one of the best reasons to vote for anyone but Governor Romney. What is more interesting for Beck's programmed followers, who have been conned into thinking Obama is a Marxist socialist, are the highly informed conservatives who are either supporting Obama or leaning toward supporting Obama. Update, 10/31/2012: There is an excellent piece today in WaPo which describes the class war "waged by the upper class." Katrina vanden Heuvel describes Romney's plutocratic nature splendidly. In a coming post, the issue of voting in swing states will be looked at from two sides. It will analyze the choice between the lesser of two evils vs. voting for a candidate that really reflects your values.